An amazing lineup of blasters for taking on the big brands. At the end of June, Blaster Hub was able to release info on the new Prime Time Toys blasters for 2016. In a clear bid to eat away at Hasbro’s shelf space, all the new blasters were available at competitive price points and claimed ranges of up to 80 feet. Now that August is here, stores are beginning to set these toys on shelves, especially at Target and Walmart. 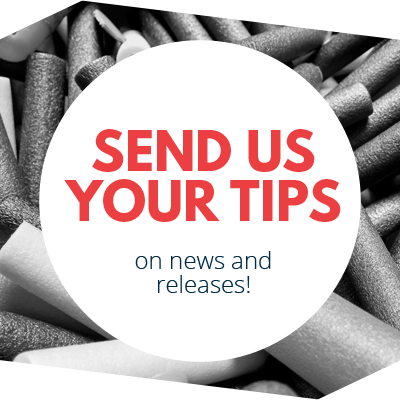 Are they worth adding to your arsenal? The answer would seem to be yes! 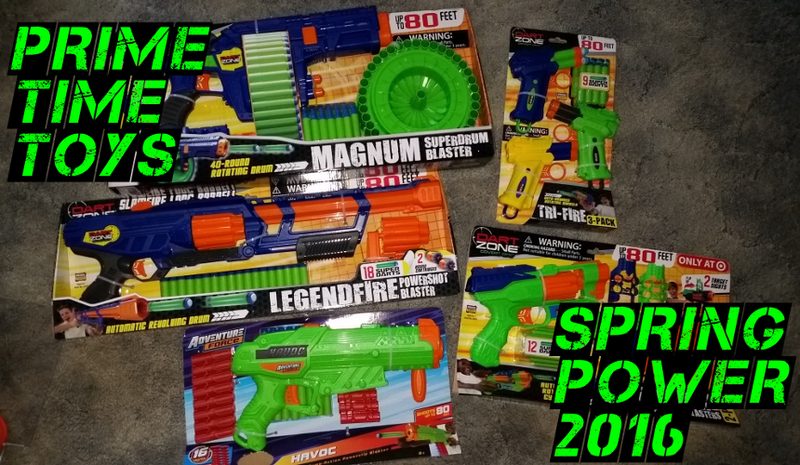 This review will cover the five NEW spring-powered blasters available on shelves. The Powerbolt is a holdover from last year (albeit with added Nerf dart compatibility), and the Quad 4-Pack Power Pack still has yet to be seen on shelves. The Enforcer, the new automatic flywheel blaster, is special enough to merit its own entry at a later date. The most anticipated (and possibly ludicrous) blaster in this group has to be the Magnum Superdrum. 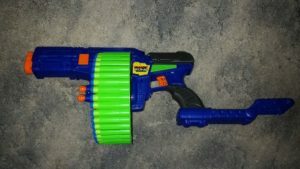 $20 buys you a pistol with a 40 dart drum and an arm rest to balance the weight. The initial loading of darts takes a few minutes, but the blasting that follows is pure, unadulterated fun. It’s very easy to handle your Magnum (huehuehue). You pull back on the slide to prime, return it forward, and pull the trigger to fire. Alternatively, you can slam-fire by keeping the trigger depressed and pumping the slide. Three darts per second seems to be the limit on rate of fire. My only quibble is with the arm rest. While it can be adjusted in both length and rotation, it doesn’t feature any way to lock it in place. Even so, if you grip your Magnum and let the weight in front hang a little bit, the plastic will stay in place against your arm. The ranges with the included darts are extremely impressive. Firing parallel to the ground, 50′ shots were easy to achieve. At an angle, meanwhile, 80′ seemed to be the average, with some shots landing as far as 92′. Be aware that slam-fire drops ranges by about ten feet. I am unsure of the exact cause of this phenomenon, but I will experiment with the internals to find out why. 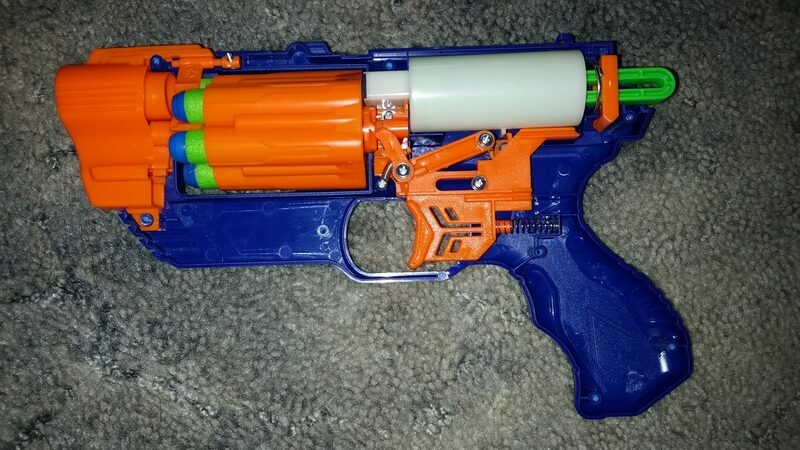 On the topic of internals, the inside of the blaster is interesting. No air restriction valve is present.The plunger has a respectable 27mm diameter. A small sled moving beneath the plunger tube engages the turret rotation and plunger priming. Also, there appear to be two catches at the rear of the shell. This would be the first area of interest for those experiments I just mentioned. Overall, this larger than normal pistol has plenty of range and endurance, and is great for the run-and-gun type of player. Grab a Magnum! 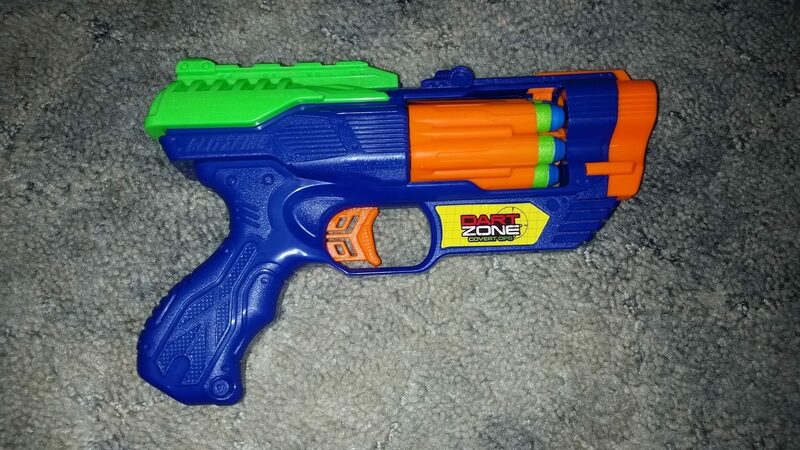 The Blitzfire Quick-Shot also has a 27mm plunger. There are no air restriction valves here, either. Other than a spring replacement and fiddling with the barrels, there are few things for a basic modder to change. Perhaps that’s a good thing, though. It’s always nice when you DON’T need to change anything. 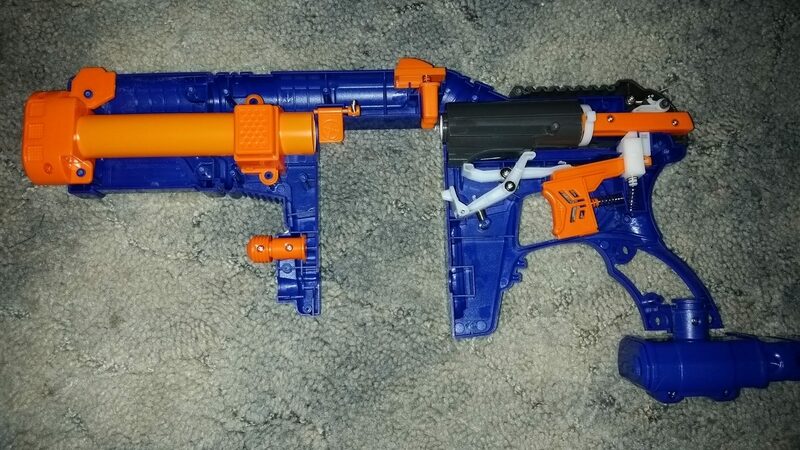 Prime Time Toys decided to do the Nerf N-Strike Elite Triad better. 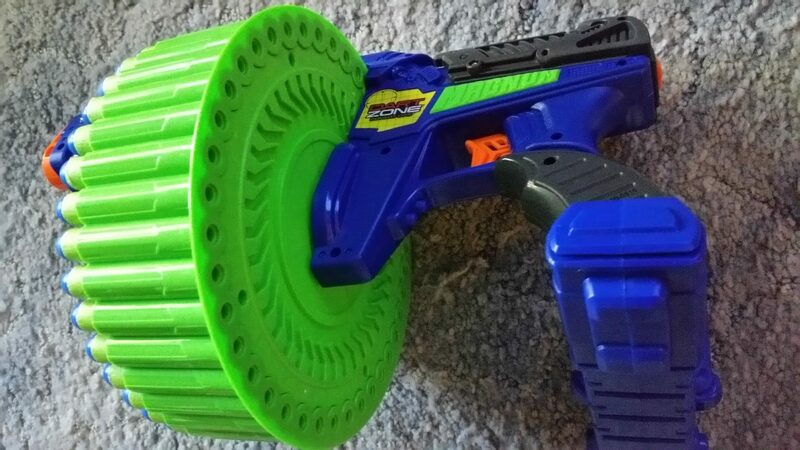 PTT managed to include auto-rotating barrels instead of using the smart AR system (which is patented by Hasbro, by the way). Pulling on the bottom of the plunger primes the blaster, but it also moves a parallel piece of plastic. This, in turn, moves a small three-prong gear and rotates the barrels. The trigger doesn’t pull back so much as it does rotate down, which does feel slightly odd. Since there is a direct path from plunger to barrel, there’s nothing preventing you from fooling around with the barrels. 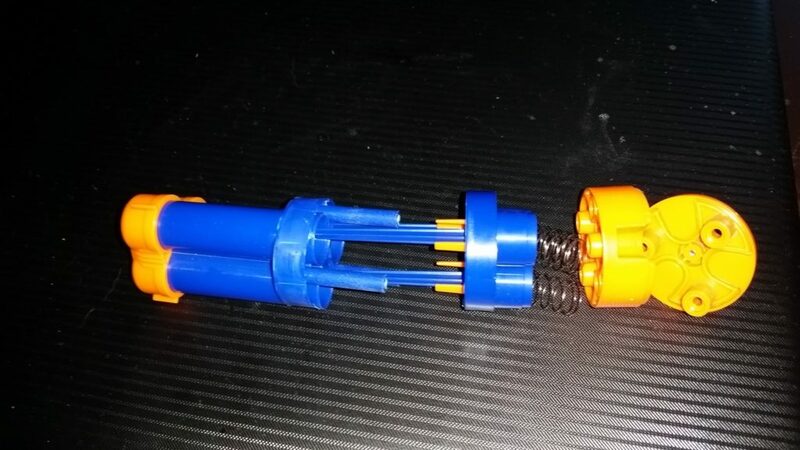 You can unscrew the barrel assembly very easily. It turns out that the Tri-Fire is the only one of the new blasters to actually have air restriction valves. You can remove them with ease once you separate the orange base. The blaster still manages to hit 80’+ on a few angled shots, but it tends to average 72′. Removing the air restrictor valves will boost that by a few feet. 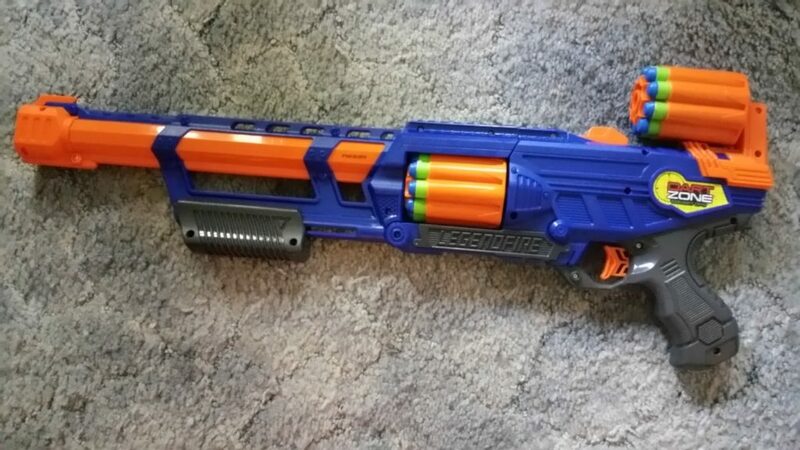 Unlike the other blasters in this group, there is room for longer barrels to be added. Some PETG would go nicely with this setup in order to harness all the plunger power you possibly can. The most important note: these blasters come in a three-pack, for $10. When Triads usually go for $6, the Tri-fire suddenly becomes one heck of a good deal. 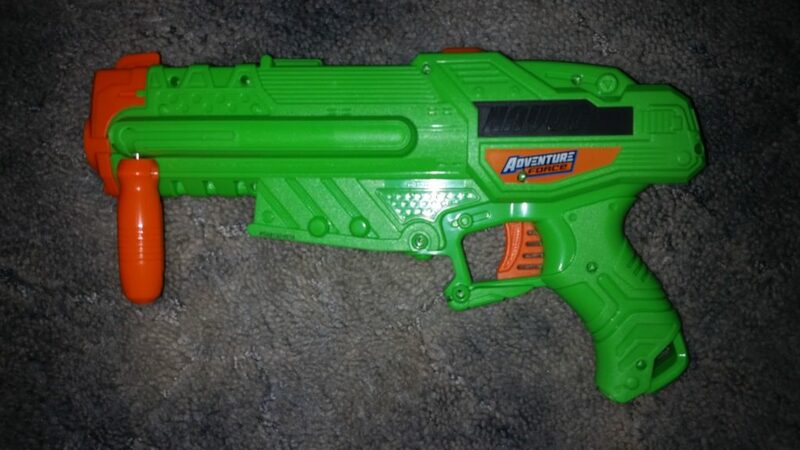 The Legendfire (green at Walmart, blue elsewhere) is a slam-fire only blaster, which may be a turnoff to some blaster fans. It does, however, have a smooth and controllable prime in a comfortable platform. Even without a functional trigger, it’s not hard to aim at a target and hit it. In addition, the Legendfire has a spare turret that can be carried on the back and reloaded while you fire from its partner. You simply pull back the orange iron sight on top to break open the barrel, and change turrets as needed. The Legendfire performed as well as the Magnum in terms of range. I was averaging 80′ average with my angled shots, and at least two shots reached the 90′ mark. I could also spam darts slightly faster, at four darts per second. The long barrel did not appear to negatively affect the ranges, so the darts are traveling straight for at least the first foot of flight. 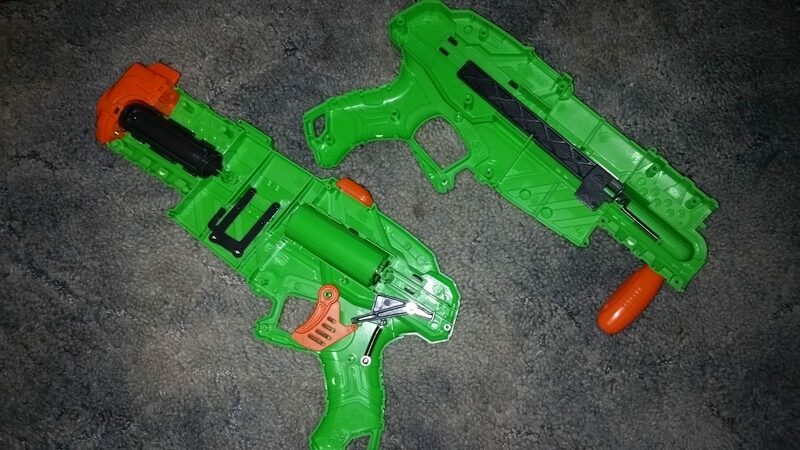 On the inside, the Legendfire looks almost identical to the Powerbolt Belt Blaster. The priming rod operates the rotation mechanism, and the catch rides along a plastic rail inside the shell. Once it reaches the end of the priming motion, the rail forces the catch down, releasing the plunger. 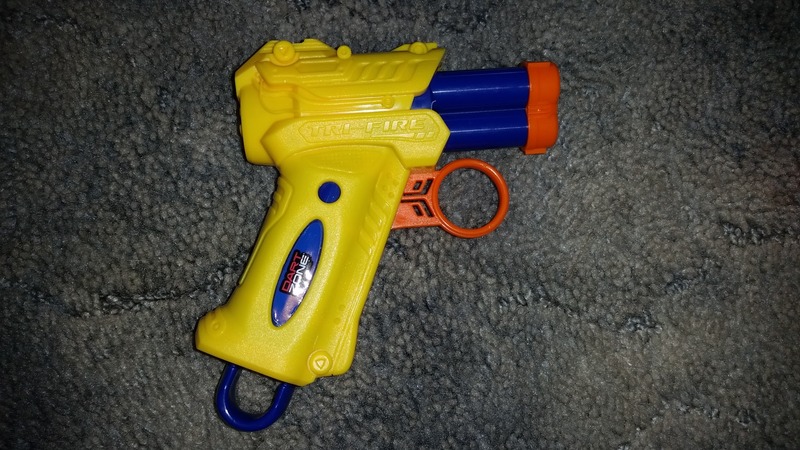 It’s not a complicated system, but there really isn’t a way to add a functional trigger with the current setup. The Legendfire is available for $16. Finally, we have a $10 surprise available exclusively at Walmart. The Havoc is a clip-loading pistol with a sliding side prime. You flip up the priming handle and pull it back. Then, you push it forward (no need to flip the handle back down), and you can fire. The clip advances upward a la the Buzz Bee Cougar. Amazingly, this blaster packed the biggest punch of the lot, with 85′ average angled shots and more than a few darts going 100′ away! More importantly, more clips are readily available from the Dart Zone website; $18 buys four 8-dart clips and 40 darts. Internally, I don’t see anything out of the ordinary. 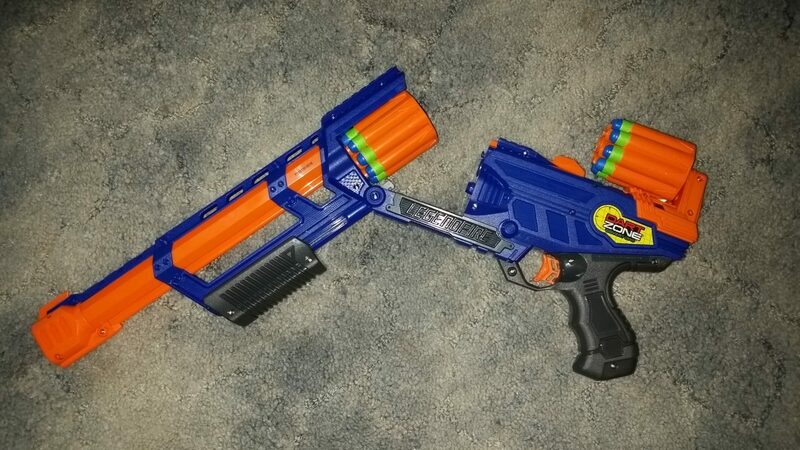 I’ll have to remove the spring and see if it’s stronger than those in the other blasters. There are no air restriction valves in this blaster (notice a trend?). The plunger tube is the same size as its brothers and sisters. One small piece did get my attention. 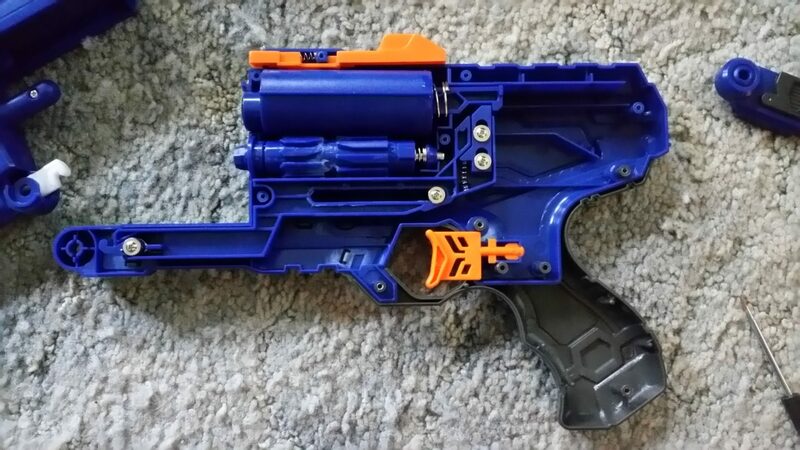 The front of the clip well has a small door that covers it, and flips up just in case you advance the clip more than once before firing. That way, an unused dart won’t cause the entire blaster to jam. It’s a nice touch for an already great blaster. 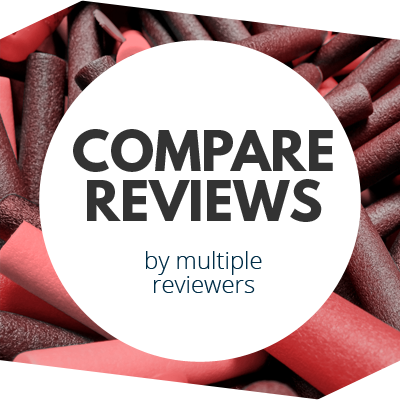 It would be a mistake to review all these blasters without mentioning what they fire. 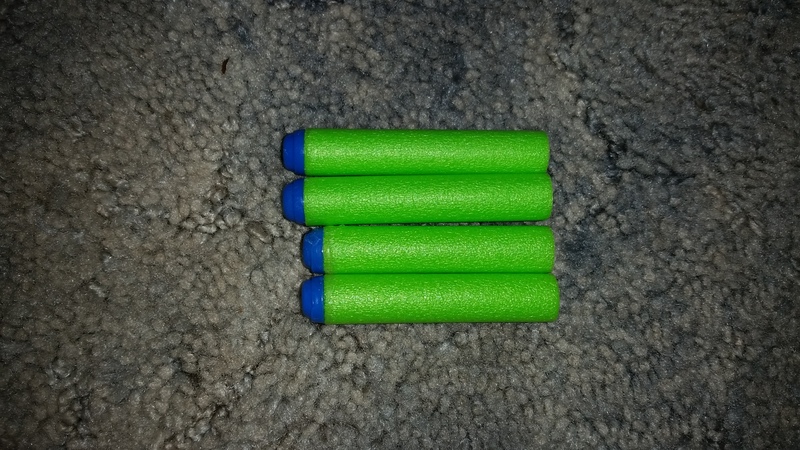 The newest version of the Superdart now matches Nerf Elite darts in length, and have higher quality dart heads. The dart head style is still the same; it just appears that the process has been improved significantly. There is less excess glue present, and the heads are much smoother. The darts weight about one gram each, compared to 0.9g for the old version. In addition, the new darts seem to fly much more accurately. For the moment, it seems these could be a solid alternative to Elites. So far, Prime Time Toys is knocking it out of the park. All of their new spring-powered blasters work as well as advertised, and are less expensive than their Nerf counterparts. The Magnum and Havoc blasters especially warrant attention. If PTT can get the sales to match their blaster quality, then Hasbro is going to have some tough competition this Christmas. Following is “B Roll” footage sent to use by PTT after this article was first posted, which will soon be found on their own YouTube channel. It gives a better idea of the Magnum in use. 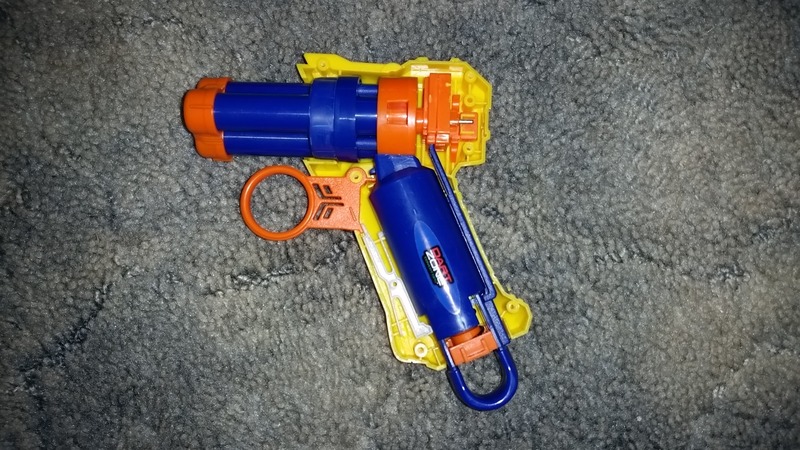 This entry was posted in Dart Blasters, Reviews and tagged blaster, dart zone, review on August 8, 2016 by BuffdaddyNerf.